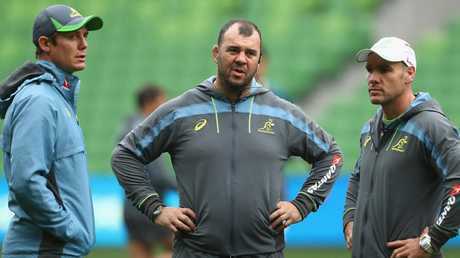 Michael Cheika will front the Rugby Australia board on Monday. 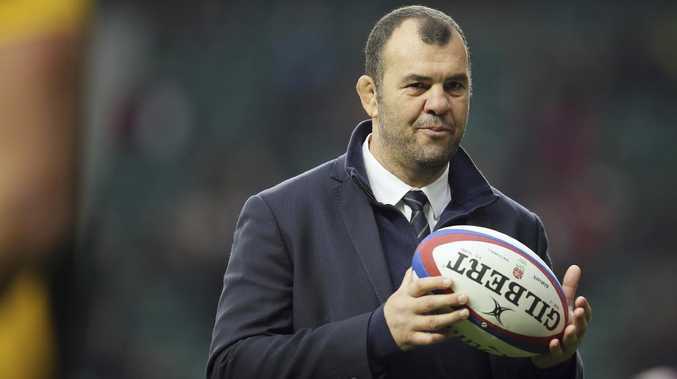 MICHAEL Cheika's fate as Wallabies coach will be determined at a high stakes Rugby Australia board meeting in Sydney on Monday. As well as Cheika being asked to explain Australia's nine defeats from 13 Tests in 2018, the board will consider reviews from high performance boss Ben Whitaker and RA chief executive Raelene Castle. Castle and chairman Cameron Clyne backed Cheika before last month's spring tour but further disappointing losses to Wales and a record sixth straight defeat to Eddie Jones' England have left disillusioned fans demanding change. It's expected Cheika will be spared the sack, despite his winning strike rate with the national team falling below 50 per cent, the worst of any coach in the 22 year professional era. The names of Jones, former Wallabies attack coach Scott Johnson, now working with Scotland, and ex Super Rugby winning mentor David Nucifora have all been bandied about as desirable Australian replacements for Cheika. Wallabies coach Michael Cheika talks to assistants Stephen Larkham and Nathan Grey. Campese last week pointed out the Cheika had blooded 35 newcomers to the Test arena since the last World Cup and that the short-term pain may prove the Wallabies' longterm gain at the 2019 global showpiece.